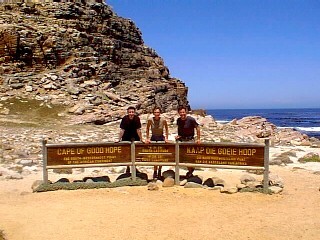 It was Christmas, we were back in Cape Town and Andrews brother James joined us. What more could be want? 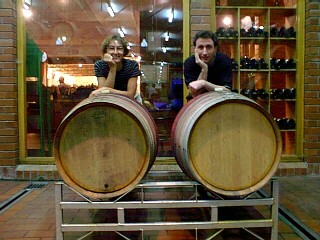 The vineyards - we got them!! 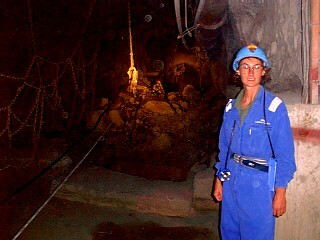 A visit to the diamond mines in Kimberly is highly recommended. Four o'clock is not a good time to be crossing borders. Beitbridge (the only border between S. Africa and Zimbabwe) is now open 24 hours per day. In an attempt to staff the immigration office for that time the number of staff per shift has probably reduced. The one hour wait to get a passport stamp was quick compared to West African standards, I suppose! There were people everywhere, babies were crying, people were pushing and shoving (mostly white people, sadly) and it was hot and sweaty. Fortunately it was only 18 km to the delightful pool at the Messina campsite. At 6am the following morning we were back on the road for a twelve hour journey to Kimberley - site of the famous (apparently) "big hole". It is supposedly the largest manmade hole in the world and resulted from digging for diamonds. The de Beers diamond industry started here and it is also the place where Cecil Rhodes made his fortune. We didn't have time to visit the big hole because we chose to take a four hour underground tour of a working mine - the Buitfontein Mine. It was an interesting tour - 845m underground. It is easy to appreciate why diamonds are so expensive. It takes a whole year of operations to obtain 2kgs of the rocks. There is a lot to do in Kimberley and if there was more time it would have been possible to find out much more about the diamond industry. We had to hit the road again and after a five hour drive we camped at Beaufort West before our next half day journey to Cape Town. 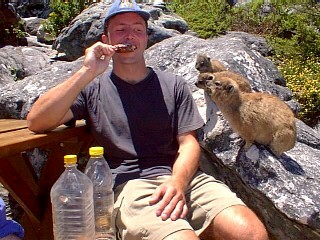 Each trip to Cape Town amazes me. It is so beautiful and the route from Beaufort West takes you through the winelands which is probably the most spectacular part of the Cape. After a few chores in town we camped at a delightful site at Stellenbosch (one of the wine regions) before another day of chores in preparation for James' arrival. The 24th and the day of James' arrival. Neither of us could sleep very well because we were excited. In fact we were at the airport two hours early. A very sleepy and very "pale" James emerged and plonked himself down in Punda for a day of sightseeing. 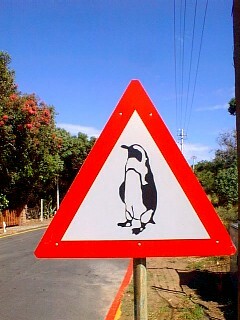 We had decided to do a tour of the Cape peninsular taking in fish 'n' chips at Hout Bay, a drive around the beautiful Chapmans Drive, a visit to the Cape Point Nature Reserve and a visit to the colony of jackass penguins at Boulders Beach. It was all a lot for James and his seatbelt held him in his chair during his regular "power naps". That night we went to the highly recommended Brass Bell at Kalk Bay for dinner. Christmas Day and the weather was glorious. 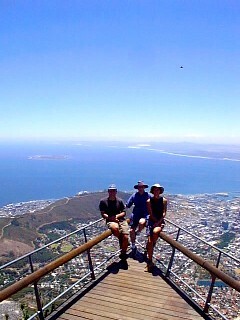 In the 30°C heat we climbed Table Mountain. It seemed a lot easier this time then when we last tackled it in September. 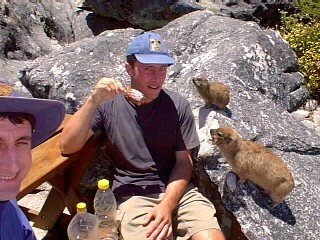 As expected the view didn't let us down and Andrew got very friendly with the rock dassies. After an afternoon at the V & A Waterfront we had sundowners and dinner at La Med before the drive to the Stellenbosh campsite. We had a document check and vehicle search at GreenPoint which was the location of last nights bomb. 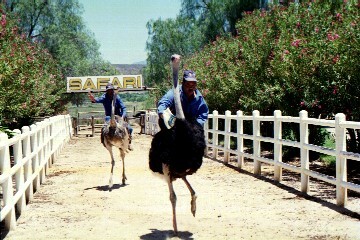 I must admit that spending the day at the main tourist attractions was a bit of a worry! (Didn't tell you that bit on the phone, mum). 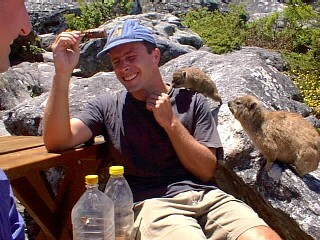 Boxing Day and a day at the vineyards was planned - one in Stellenbosh, the other at Franschoek. The day didn't go as planned. 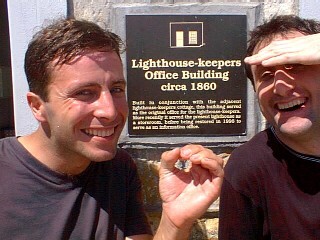 After half of the first tasting at the Neethlingshof Estate, James and I .... we were smashed. Andrew was on tiny measures as he was driving and wine does tend to be stronger than his usual "Half a shandy Bass". The chaps behind the bar kept giving us double measures and forgetting to sign the chit so we ended up having about triple what we should have had. The cellar tour was interesting and provided a good opportunity to break up the tasting session. Afterwards we returned to my favourite Boschendal Estate - for tea and cakes. Franschoek has really changed in the three years since we last visited and it was sad to see the growth in commercialism. That afternoon we continued on to Oudtshoorn via a very cloudy Robinsons Pass and were greeted by a crowd of Gold Wing riders and their country music at the campsite. We just loved waking up to them there " Dixy Chicks" gals..... loud and proud at 6.00am!. 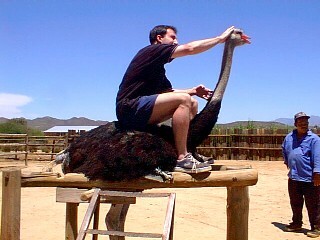 The following morning after a swim in the pool we visited the Safari Ostrich Farm where James had a go on one of these big birds. They are great to watch and have so much character despite their tiny brains. Obligatory ice creams followed! 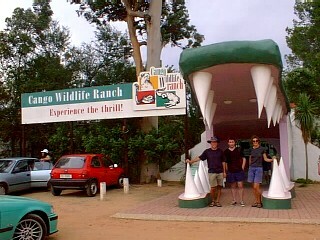 Later at the Crocodile Ranch we were entertained by masses of horrible crocs and loads of lions, cheetahs and jaguar. The latter we had never seen before. 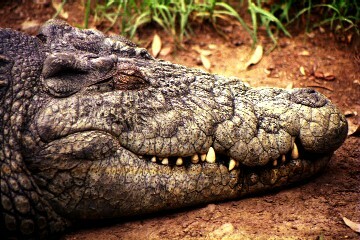 Three years ago the ranch had been washed away by flash floods and there were loose crocs roaming the country! Andrew couldn't resist getting in the cages with a baby lion and the cheetahs. 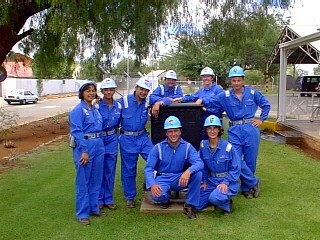 That afternoon we started our relay to Zimbabwe - 24 hours non-stop to Bullawayo. The distance had to be covered to get to Zimbabwe for New Year and we figured that this would be the best approach. 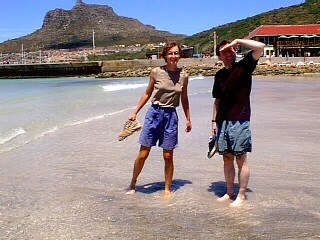 The N1 was a much better road than the N12 we came down on and most of the journey in the dark was on dual carriageway. By daybreak we were nearing the border with Zimbabwe.